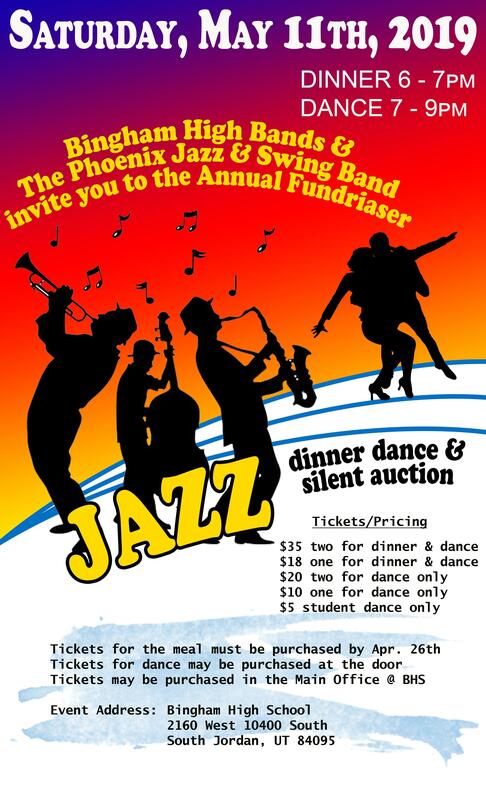 The 13th Annual Dinner Dance Fundraiser in support of the instrumental Music Department at Bingham High School will be held this year on May 11, 2019 in the BHS Cafeteria. Entertainment starts at 6:30 pm with meal service beginning at 6:00 pm. There will once again be a silent auction, a great meal with dancing, and music all night to raise money for the Bands at Bingham! They can also be purchased by cash or credit in the BHS main office during normal business hours, or with cash from any Jazz Ensemble member. Meal tickets must be purchased by April 26th. After that date, all non-meal tickets can be purchased from all outlets, including at the door, by cash or credit, BUT NOT online. We look forward to seeing all of you there to support the bands at Bingham!